Living in an Atlanta High-Rise gives you a fantastic "Lock and Leave" lifestyle, and most of these condos are in buildings with a long list of amenities. This lifestyle has definitely caught on, and there are now condo towers throughout Buckhead, Midtown and Downtown. If you want the low maintenance lifestyle of a condo but don't want to have to pay for the amenities you might consider a mid-rise condo. 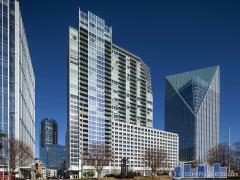 Below you'll find every available high-rise condo for sale today in Atlanta, sorted by price. You can also search high-rise condos by neighborhood by visiting our Midtown High-Rise Condos page, Downtown High-Rise Condos page, or Buckhead High-Rise Condos page.